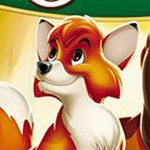 The Fox and the Hound is one of Disney’s lesser-known animated movies. It’s definitely one of the darker stories to come out of the animation studio. Though it has many moments of Disney cuteness and comic relief, the themes of loss and prejudice which permeate the film are its most memorable elements. Other Disney animated films have gotten the star treatment in recent special edition DVDs (Cinderella, The Little Mermaid), boasting restored negatives and a whole second disc of bonus features. This “25th anniversary edition” of The Fox and the Hound gets no such hoopla, with a full screen presentation and just a few extra features on a single disc. The film opens on a misty forest, reminiscent of the one where Bambi lived. A vixen runs away from unseen hunters with a kit in her mouth. She manages to deposit her offspring in a safe spot before meeting the same end as Bambi’s mother (anyone familiar with Disney’s Bambi will notice other similarities as well). The orphaned kit is taken in by a kindly old widow, who names him Tod. Meanwhile her neighbor, a dedicated hunter, brings home Copper, a hound dog puppy. Not realizing that they are supposed to be enemies, the two canines become fast friends. When Tod says “we’ll always be friends forever, won’t we,” we know the two are headed for trouble. Poor Tod will again find himself in peril once Copper learns to be a real hunting dog. The movie’s main lesson — about the consequences of adults passing on their prejudices to children — is powerful and appropriate for children. The movie itself is unrelentingly grim at times. The comic relief — a couple of wacky birds chasing after a stubborn caterpillar — felt like it belonged in an animated short and not in this movie. Though the fate of the characters at the end makes sense, I found myself wishing for a little more fairy tale and a little less realism. A 6½ minute featurette, “Passing the Baton: the Making of The Fox and the Hound,” which was probably made in the ’80s, has about as many interesting tidbits about the movie as can be crammed into such a short span. Where other Disney making-of documentaries tend to be long-winded and pleased with themselves, this one barely scratches the surface. More enjoyable are two classic shorts from 1941 with themes of inter-species interaction, Lambert the Sheepish Lion and Lend a Paw. Forest Friendship Game, a sort of virtual hide-and-seek game, is intended for the youngest viewers. A DVD storybook, featuring the two main characters, is brief and the graphics aren’t as interesting or stimulating as an actual book. Not coincidentally, the sneak previews include a trailer for The Fox and The Hound 2, an upcoming straight-to-video release. The picture is good, though the colors in the backgrounds occasionally shift. Perhaps the negative for this movie will be a candidate for restoration someday. Although this movie was shot and shown in theaters in wide screen, only full screen versions exist on video. The picture on the two 65-year-old bonus shorts was excellent. The sound is fine, though unremarkable. Pop it in and watch the movie. Then check out the bonus shorts. Animation fans should check out the galleries. The rest of the extras are skippable.